During the last Revspace festivity I met a person that was showing off his PIC based VGA "jumping jack" game. Because I'm interested in the technology behind creating a VGA signal with a micro-controller and (almost) no external hardware (I'm planning to do something similar with my RhoCoCo Retro Home Color Computer, and my ZX81 clone also works this way) I asked if he knew a bit about the technical details of the game, and we started talking. When I heard he was from the former Yugoslavia I told him that during my search for a simple computer to re-design, I had considered doing a clone of the Galaksija. he responded that he knew the Galaksija well, and that in fact this jumping jack game was designed by the very same person that designed the Galaksija namely Voja Antonić! this encounter re-sparked my interest, and I did some research. 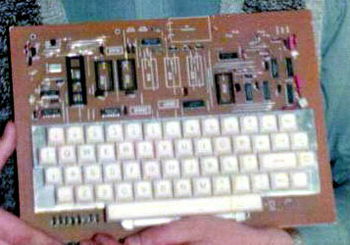 Previously I had heard that it was no longer possible to build a Galaksija because the original used some undocumented special behaviour of the original Z80's that modern Z80 CPU's no longer have. The original Galaksija was amazingly simple, even simpler than a ZX80, when I first saw its schematic I could not believe it could work, but I had seen some (youtube) video's with the Galaksija running BASIC, and the its screen and font looked very nice an clean and well formed. But except for the Z80 some ROM and RAM chips it used just 12 simple Low power Schottky TTL chips. Alas, there was no hope you could build one with current technology, but there were some rumours about a "CMOS" version, that was said to be working with modern schematics, and I had seen another Schematic of an unmarked "Galaksija computer" that used one programmable GAL chip, and 74LS logic, but almost no other information was available about it, and the content of the GAL was not described, which made replication this version impractical, there was also no info if this version would work with a modern Z80. So I gave up on the Galaksija, and after considering some other options decided to make a replicate of the ZX81 because there was plenty of information about it available. But I never forgot about the Galaksija, and so decided to do some more research. Which was difficult because most information was written in the Slovenian language. I soon I found out that one Tomaž ŠOLC had designed a "modern clone" "Replika mikroračunalnika Galaksija" for his university thesis, and had done a talk about it during the 29th Chaos Communication Congress, in Hamburg, Germany. in December 2012, so quite recently. This also revealed (without going into detail) that a GAL version also existed, but that the "modern" version was indeed called the "CMOS Galaksija" . 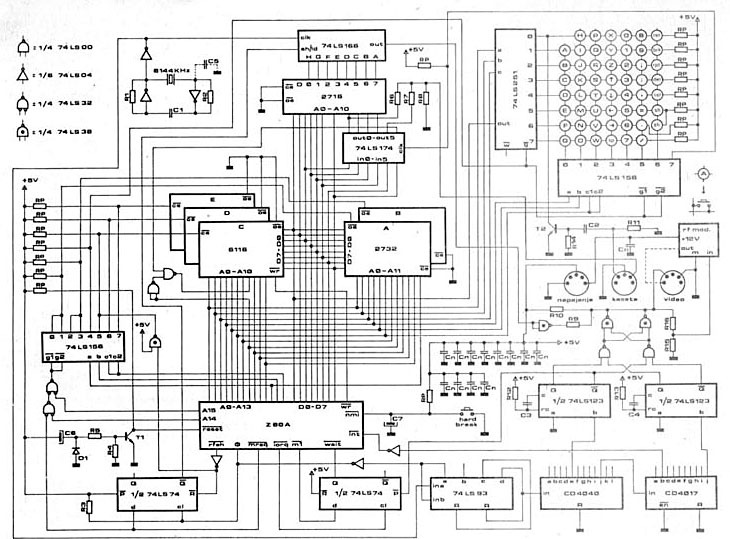 Alas, I could not find a schematic of this "CMOS Galaksija", at least not in a usable (.PDF) form. just a .SCH for which no CAD program was listed, and which no CAD system I owned could open. I could see from pictures of the board that this Galaksija was different from the original, but the youtube movie of the talk he did made it clear that it would work with a modern Z80. Not much more info (except for a complete disassembly of Galaksija basic was available. Except there was a long .PDF document written in Slovenian which was his university diploma thesis, filled with an unknown to me language and many intriguing tables and pictures, which probably had all the details about his (assuming successful) clone. So I simply translated his thesis! Obviously I used a translating engine, Google Translate, it was one hell of a job. its still a bit rough, and missing many pictures, but with the original .PDF beside it, it is understandable, it is certainly interesting reading material. I'm currently studying it, to see if it will help me design my own Galaksija clone. Finally I managed to extract a view-able schematic from the .SCH I found, using gEDA and the GIMP and some trial and error. opening the Schematic with gEDA proved a frustrating result, as the .SCH did not include schematic library elements for any of the logic building blocks, the .SCH opened as just a bunch of interconnects. However, while using the GIMP to extract a .PNG file from the malformed schematics, I discovered the GIMP showed a full preview of the previously incomplete Galksija schematic, and opening it with the GIMP proved to be a success, unlike the half a dozen other programs I tried before! So no I have the full schematic of CMOS Galaksija! I'm studying it now It looks simple enough, but compared to the original schematic as first published it a bit more involved. 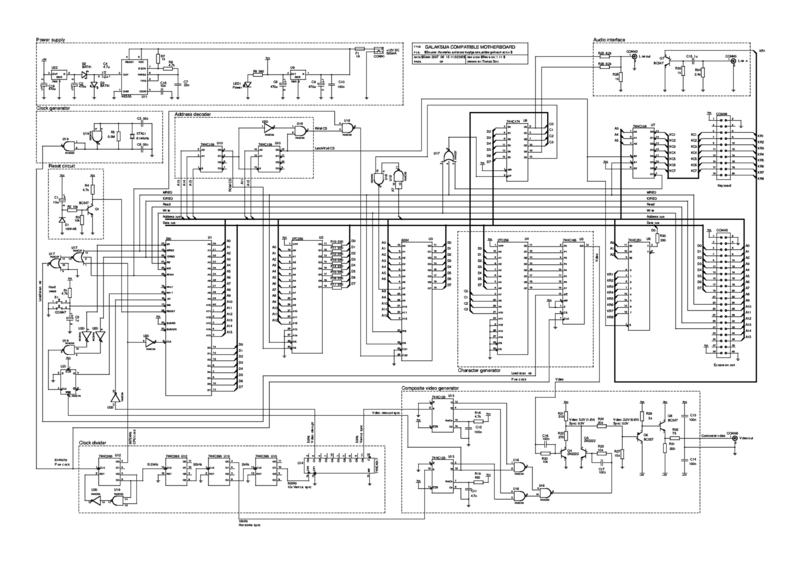 In fact the first schematic looks ridiculously simple, and it even includes the keyboard logic. I'm planning to bring back the CMOS schematic to its barest simplest form, and build it up on a simple single sided board with nothing but PTH components, for easy build-up, but still more modern than it was. From that I might add some extensions to the original. Layout work on the ZX81+35, and its PSG means I had to stall this project for now. This page was last modified on 5 September 2016, at 23:19.